Among the many lessons of history is that tastes can vary greatly over time. I've oft-lamented, for example, that the name of Abraham Merritt is not better known and lauded today, as he was in his own lifetime. Another author who is, if anything, even more obscure than Merritt is Seabury Quinn. Among the small number of people who still recognize his name, Quinn is often dismissed out of hand as a hack of the lowest sort. 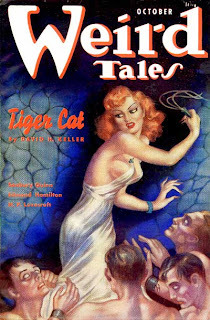 This may be due to the fact that, during his lifetime, Quinn wrote over 500 short stories, a great many of which appeared in the pages of Weird Tales (indeed 60% of all issues between 1923 and 1954 include at least one story him). And while it's true that not all of Quinn's output is worthy of consideration, even his worst work often has, in my opinion, clever ideas and obvious authorial enthusiasm. 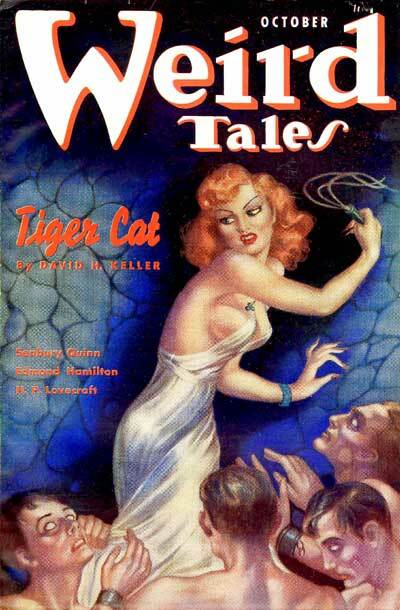 In his day, Quinn was, by far and away, the most popular author writing in Weird Tales and even H.P. Lovecraft, who was no fan of his stories, found him an "exceedingly tasteful & intelligent" man. One of Quinn's longest running series (nearly 100 stories in all) concerned the detective Jules de Grandin. De Grandin is a French physician, police officer, and expert on the supernatural. Traveling with his companion, Dr. Trowbridge, who plays Watson to his Holmes, he investigates crimes and solves mysteries in which the occult seems to be involved. One of the interesting things about the De Grandin stories is that, while the occult often is involved, that's not universally the case. Some mysteries are revealed to be the work of ordinary, albeit unhinged, human beings and it's this quality that I think contributes to the series's longevity. Starting a tale, you never know at the outset whether there actually is a werewolf on the prowl or if it's all an elaborate hoax concocted to throw De Grandin off the scent. The autumn dusk had stained the sky with shadows and orange oblongs traced the windows in my neighbors' homes as Jules de Grandin and I sat sipping kaiserschmarrn and coffee in the study after dinner. "Mon Dieu," the little Frenchman sighed, "I have the mal du pays, my friend. The little children run and play along the roadways at Saint Cloud, and on the Ile de France the pastry cooks set up their booths. Corbleu, it takes the strength of character not to stop and buy those cakes of so much taste and fancy! The Napoléons, they are crisp and fragile as a coquette's promise, the éclairs filled with cool, sweet cream, the cream-puffs all aglow with cherries. Just to see them is to love life better. They——"
The shrilling of the door-bell startled me. The pressure on the button must have been that of one who leant against it. "Doctor Trowbridge; I must see him right away!" a woman's voice demanded as Nora McGinnis, my household factotum, grudgingly responded to the hail. "Th' docthor's offiss hours is over, ma'am," Nora answered frigidly. "Ha'f past nine ter eleven in th' marnin', an' two ter four in th' afthernoon is when he sees his patients. If it's an urgent case ye have there's lots o' good young docthors in th' neighborhood, but Docthor Trowbridge——"
"Is he here?" the visitor demanded sharply. "He is, an' he's afther digestin' his dinner—an' an illigant dinner it wuz, though I do say so as shouldn't—an' he can't be disturbed——"
"He'll see me, all right. Tell him it's Nella Bentley, and I've got to talk to him!" De Grandin raised an eyebrow eloquently. "The fish at the aquarium have greater privacy than we, my friend," he murmured, but broke off as the visitor came clacking down the hall on high French heels and rushed into the study half a dozen paces in advance of my thoroughly disapproving and more than semi-scandalized Nora. "Doctor Trowbridge, won't you help me?" cried the girl as she fairly leaped across the study and flung her arms about my shoulders. "I can't tell Dad or Mother, they wouldn't understand; so you're the only one—oh, excuse me, I thought you were alone!" Her face went crimson as she saw de Grandin standing by the fire. "It's quite all right, my dear," I soothed, freeing myself from her almost hysterical clutch. "This is Doctor de Grandin, with whom I've been associated many times; I'd be glad to have the benefit of his advice, if you don't mind." She gave him her hand and a wan smile as I performed the introduction, but her eyes warmed quickly as he raised her fingers to his lips with a soft "Enchanté, Mademoiselle." Women, animals and children took instinctively to Jules de Grandin. It's all fairly typical pulp prose, right down to the rather stereotypical way that De Grandin is portrayed. But, like a lot of pulp authors, if one can look past this -- or, alternately, luxuriate in it -- what one often finds is an engaging mystery filled with spectacle and creativity. In the case of "Pledged to the Dead," the story concerns the young woman, Nella Bentley, whom Dr. Trowbridge has known since she was a child. Nella is engaged to be married to Ned Minton, whom Trowbridge also knows. The two have been sweethearts since they were quite young, so their engagement and eventual marriage was a surprise to no one. However, after a trip to New Orleans, Ned calls off their engagement, claiming that he is no longer worthy of Nella's affections, a situation that his headstrong fiancée does not accept, which is why she turns to Dr. Trowbridge and his associate for help in determining just what has happened to him. I don't think I'm giving anything away by revealing that the plot concerns Voodoo and its possible hold over Ned. Why else make the New Orleans connection if not to introduce Voodoo into the tale? Of course, what makes a good Seabury Quinn story worthwhile is not necessarily its originality of its basic ideas but rather the cleverness with which he takes well-worn tropes and plays with them. He does that in "Pledged to the Dead," employing Voodoo and all its paraphernalia in a fun way that makes for a good, if light, read. No one's going to be mentally challenged by a Quinn story -- that was never his intention -- but I do think people will enjoy them. If you've never read any of Seabury Quinn's fiction, it's worth doing so, even if it's just to see why he was so well regarded by the readers of Weird Tales. He's not to everyone's taste but he was very good at what he did. Yes, Seabury Quinn!! Many a CoC homebrew adventure was inspired by his tales. I've lauded him over the years, and held him aloft in the comments here many times. But I think you hit on it, it's his spark of life, the energy in his prose that makes him, in my eyes, a great author, and conversely, why I see HPL as a bit mundane, more than likely because his prose lacks that spark, that energy. Thanks for posting. My only petty objection to the Jules de Grandin tales is the silly French phrases thrown in here and there. Otherwise, yes, Quinn's works I enjoy, and it's easy to see why readers of Weird Tales made him their favored author over his, considered today, more popular contemporaries. For me, he's another unheard of and obscure author of Fantasy -- this Mr. Seabury Quinn. Thanks for making me aware of him, James. I very much appreciate it. Quinn's story, Roads, which is his version of the origin of Santa Claus, is a real classic and showed that he had more in him than just hacking stuff out, too. My only petty objection to the Jules de Grandin tales is the silly French phrases thrown in here and there.